Today we had a bit of warm weather and some pockets of sun, so it was transplanting day. My container garden is moving along nicely. 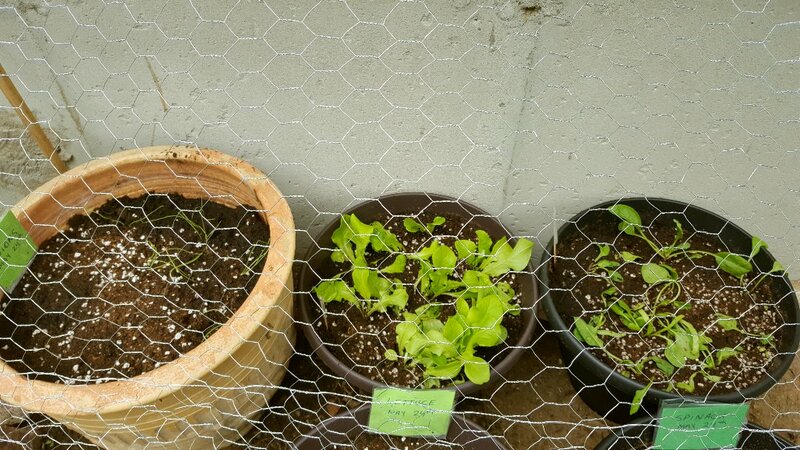 I'm relieved to get the lettuce and spinach into bigger pots! On the left are my spring onions. They only took up half the big pot so I planted more seeds in the other half. I have three areas that I dug up for my veggies and this is the first one. 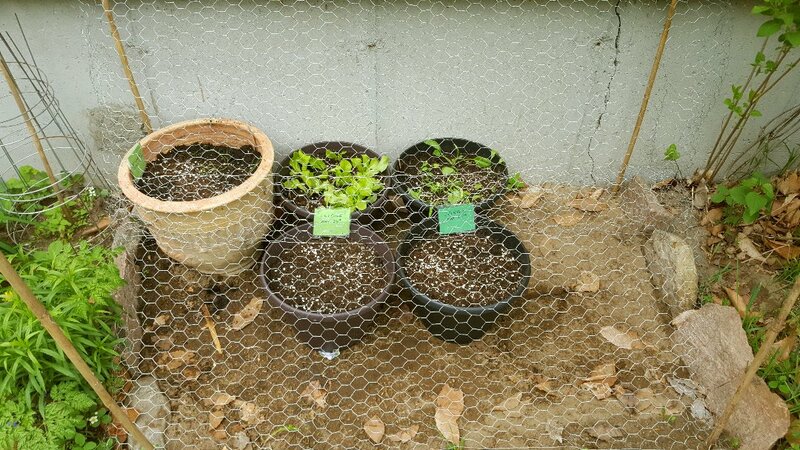 The two extra pots in the front are newly sown lettuce and spinach seeds. I decided I'm not taking a chance with the curious Blue Jays and grackles...everything will have a chicken wire cover. This is just a temporary one, when the sun goes away, those black flies swarm so I wanted to get something quick done. Next sunny day I'll make a proper fence and chicken wire top. 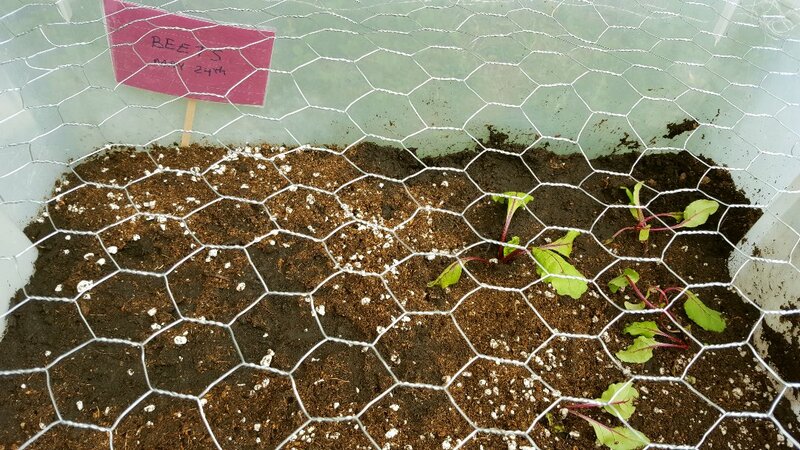 I also transplanted my beets and planted new seeds in half the container. I took care of the crops that could tolerate cooler nights for now. This is what's left of my seedlings, not including the herbs. Peas, pumpkins and three varieties of tomatoes. These will come in at night for another week or so until the nights stick to 15 degrees and up. Tomorrow I have to shop for containers and get some more soil! 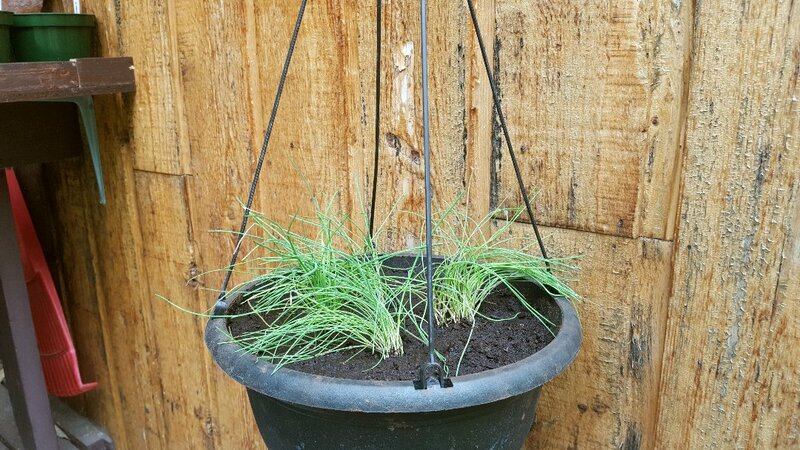 I also transplanted my two little pots of chives that I got last summer. They were the only plant that lasted through the winter in my window. 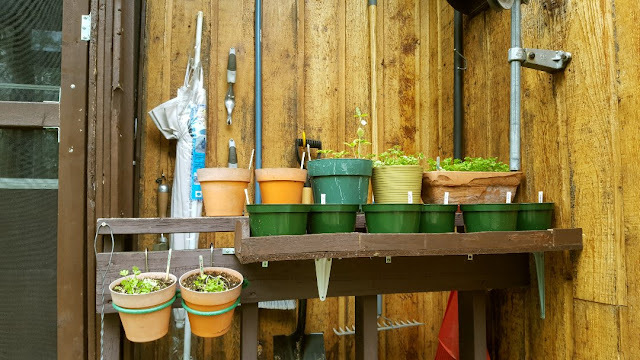 Now they have lots of room to breathe, those old pots were way too small. You are a wonder! What a lot you got done and good construction to boot. Who says women can't do what needs to be done?? You should feel very proud of yourself. And, my goodness, your plants are coming along so very nicely. They all look great. All this experience is going to be priceless when you and Alex move to your own homestead. 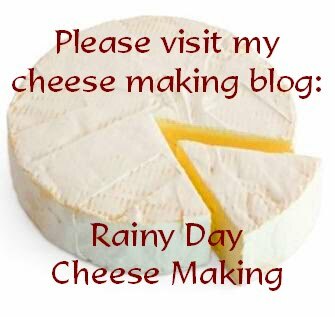 Isn't all this learning and practical experience fantastic? Love reading about and seeing all the progress. But . . . but . . . where are you going to sit on the porch? Looks to me as though Jack has claimed the only chair! I'm so happy about my seedlings, but I guess they are full-fledged plants now! It feels good to have gone some transplanting done and some planted for the next round too! You know, my amateur-ness is teaching me some lessons...I counted my tomato plants...I have 19 to transplant...eegad, what was I thinking? Of course I will use them or can them, but that's a heck of a lot of termater plants!!! 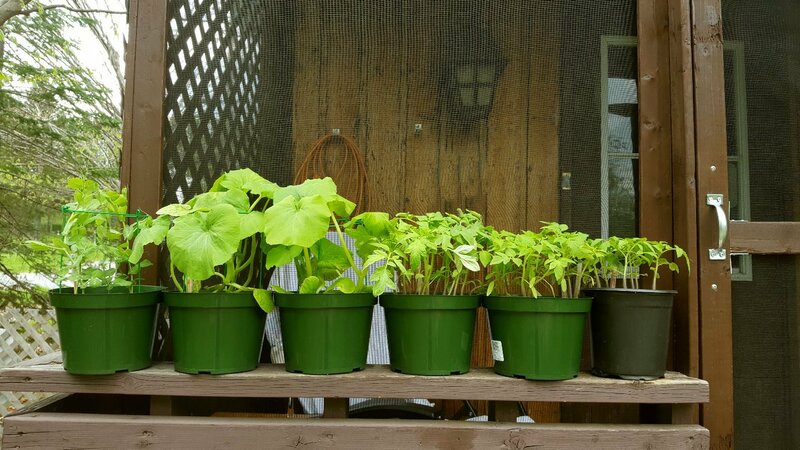 When I was planting the seeds, I figured...well, if I plant 6-8 per pot, then I can be sure that at least a few will grow in each one...THEY ALL GREW!!! I have some good seeds!!! You have done a really nice job, you will enjoy it this summer! Come on down and build one for us! Ha! We almost used artificial grass once on a project but didn't because we weren't sure how it would look. Now that I see yours, I LOVE this look!!! Good thought on the chicken wire. I am going to have to up my game next year in this department - the birds have had at my grain more than once. 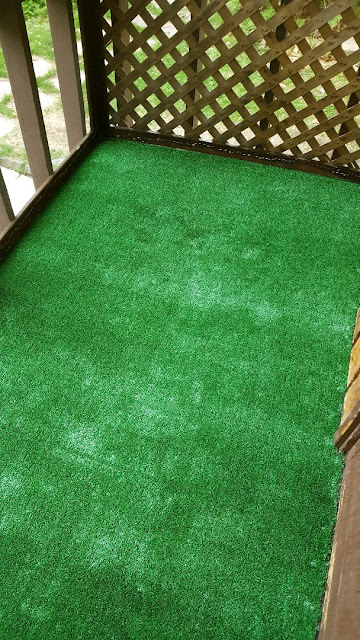 Hey, I just bought the exact same fake green grass for my balcony! Looks good, eh? Look at you go!! you'll be a full fledged homesteader in no time at all. Cooking with all those fresh goodies will be your best reward. Please have a glass of wine for me too. The porch looks great. Glad you got it all done. 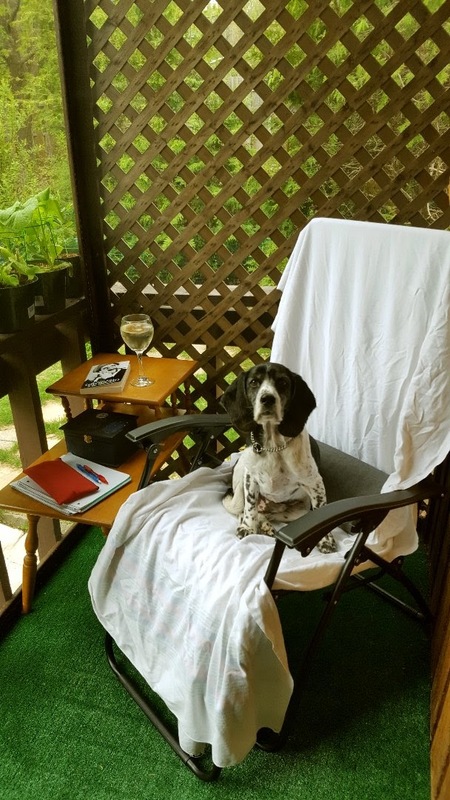 We've talked about screening in one of our porches, but just haven't had the time yet. I don't think it will be the front porch either. We like it open. Kudos to you. You accomplished so much in so little time. OMG! That looks totally lush and cozy! Well done you! I would never have the patience to do that. I get frustrated quickly and if things don't line up that would tip me over the edge. Good for you for sticking it out and getting it done. Love the grass carpet! All your little plants look incredibly strong! 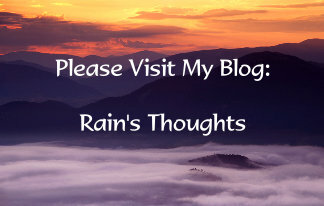 I planted everything last weekend - I will take pics and send them to you. I took a chance with getting everything planted but so far nothing looks like it won't make it. I hope they all do. I tossed some 4 o'clock seeds into the ground yesterday....I hope to see some little green things sticking out of the ground in a couple of weeks. I love the smell of those - and nicotiana. Thanks Gill! 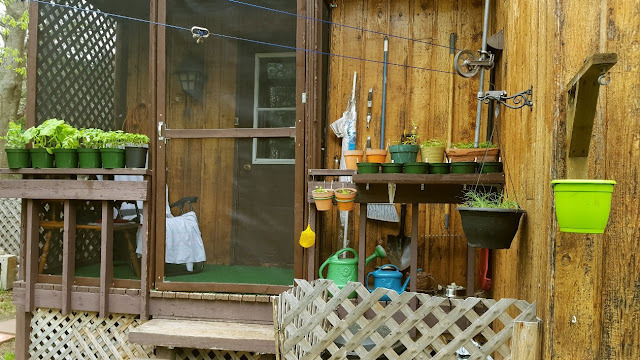 :) Last summer I used whatever we found in the old shed and it was a mediocre system, this summer, I won't have to sit with my fly swatter at the ready! Lol 1st Man! :) NO WAY...my carpentry work is done for this summer! ;) I LOVE the fake grass...there are a few types, this one is more of a turf, it was the cheapest so that's the one I got. I really wanted to get the one that actually looks like grass, but it's plastic...not so sure about that. I'm curious to see how long it lasts with all the canine wear and tear. We put some up 2 summers ago on the upstairs veranda and so far it's doing well. Thanks Carol! :)) Oh gosh, 105...you know I kind of envy that right now! It's only 12 out today, which is mid 50's. Have you thought about shade cloth? I've never used it myself though. Thanks Kristina! :) Well, Alex really wanted me to wait, but time wasn't on our sides. The black flies are intolerable in the mountains...and they are out now so I knew I had that one week to get it done or I'd really be suffering! I don't know that I'm allergic to their bites, but they swell up so badly on me. I do wish I could have the porch open though. Oh thanks Dianna! :)) You wouldn't have enjoyed this project if you get frustrated quickly...I see the merit in having the right tools...but the budget was so frugal this year. We're definitely going to invest in lots more tools when we buy our place though. It makes it less frustrating if you have the right tools that's for sure. I do love that grass carpet! Canadian Tire, $5.29 a foot here. I had to look up 4 O'clocks...they're so pretty! I have yet to start my flower seeds...those will wait for the first week of June too, when I start the second round of pumpkins in the ground. I have my Moon Garden all planned! :) I'm very pleased with the gardening so far, my plants really are healthy and I'll be honest, I kind of winged it this year. Looks great! Both porch and garden. Glad to hear Alex is doing better. Being sick really takes it out of a person. Your porch looks wonderful, love the carpet/grass and you certainly deserve to sit back and enjoy ALL your accomplishments! So glad Alex is feeling better and your seedlings all look so healthy...you are an amazing woman! Thanks Nancy! :)) That is Jack on MY chair, well, what's mine is his, I have no choice in the matter lol...yes, all of those plants were started as seeds in my only sunny window in April. They grew much faster than I expected to be honest! This is my first attempt at a big garden from seed. The packages always said to plant indoors 6-8 weeks before the last frost. I started most of these 4 weeks before last frost and they're ready to be transplanted already. I'm really impressed by the quality of seeds I got this year that's for sure! Hi Nik :)) Thanks! Jack is very happy as long as I don't "make him" go outside in the yard if I'm not velcroed to his side. Funny...he reminds me so much of my pugs, I'm so happy with him, all the aggression is pretty much gone in him, yay! :) I hope your strawberries thrive! I bought strawberry plant seeds from Veseys. I'm just waiting for the warm weather to plant them outside in a pot, and I'm hoping the old plant comes back to life too.